As a veneers dentist, we are able to offer our patients a great and highly effective way to improve their smile. With much of the modern world looking for solutions to improve their smile, there are endless solutions available. While most of these are effective in some regard, each of the solutions has advantages as well as disadvantages. With dental veneers, there are no immediately obvious disadvantages, giving them the edge for correcting any number of problems. The first thing to know about dental veneers is that they enhance and improve the existing teeth without taking away a great deal from the natural enamel. Other solutions may require completely replacing the enamel with their own solution. Looking at the example of dental crowns, we know that placing dental crowns requires removing a large portion of the enamel. Removing the enamel helps the crowns to look more natural with the rest of the teeth. With dental implants, we have to remove the entire tooth and the root to make way for the implant and its new crown. On the other hand, with dental veneers, the veneers dentist will only shave away a minute portion, often millimeters, of the tooth’s enamel to fit the veneers. This gives people the stability and structure of using natural teeth, enhanced by the beauty, luminosity, and strength that comes from placing dental veneers over the enamel. A second advantage comes from the fact that a veneers dentist will greatly shorten both the treatment and recovery time when someone uses veneers instead of another solution. Dental veneers can resolve minor malocclusion or crooked teeth. We will fit the veneers on the second visit with a healing time of hours and not weeks or months. On the other hand, if someone straightens the teeth using braces or Invisalign®, then that individual is looking at a year or more of treatment. After these longer treatments, the patient would still need other services such as whitening the teeth.The greatest advantage that dental veneers have from the perspective of a veneers dentist is the vast number of common dental problems they can solve quickly, efficiently, and without a great deal of expense. Dental veneers can help with mild malocclusion though severe cases will still require the skills of an orthodontist to correct. A veneers dentist can help you to cover up those unsightly gaps that sometimes develop between teeth by correctly placing the veneers in a way that reduces the space between your teeth. We can even whiten teeth that are stubbornly refusing to change by traditional means. In essence, dental veneers are a one-stop solution to a host of dental problems. 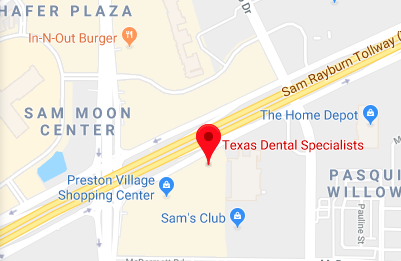 Call us at (214) 619-6329 for more information from Texas Dental Specialists or to schedule an appointment in our dentist office in Plano. You can have a stunning smile with dental veneers. Hollywood smiles do not come naturally. Instead, they come at the expert hand of a skilled cosmetic dentist. While stars are smiling on the big screen, keep in mind that your smile can look that amazing when simply working with the right dental professional. One of the first things that you should do to improve your smile is to have a professional teeth whitening completed. This can dramatically improve your smile without costing a lot of time or money. Bright white teeth are one of the first things that people notice when you smile so by having this procedure done you can instantly improve your appearance. Correct damaged teeth. If your tooth has gotten cracked or chipped, it can be corrected and restored to full functionality and appearance by using a veneer. Since it is placed directly on top of the tooth, the natural one must still be in place. Dental implants are a better solution for when a tooth needs to be replaced. Close gaps. Small gaps in the teeth can be closed by using dental veneers. This is much faster than wearing braces. Instead of spending two years to correct your smile, it can be done in a matter of months. Straighten teeth. When teeth are slightly crooked, their appearance can be improved with veneers so that it looks straight without going through a lengthy process. Make teeth even. If you have one tooth that is longer than the other, this can be corrected with cosmetic dentistry. You can have a completely uniform smile using veneers. The reason why Hollywood smiles look so glamorous is because their teeth are perfectly symmetrical, even, straight, bright, and white. This is not normal or natural. Most people have some level of imperfections whether caused by drinking too much coffee or having cavities as a child. The good news is that all of these imperfections, whether big or small can be corrected by an experienced dentist. If dental veneers are not right for you, there are other options that can be considered such as implant dentistry, crowns, bridges, Invisalign, and even orthodontics. All are viable options for improving a smile and can work together or separately to help you achieve your smile goals. When discussing options we will review things like how long each procedure will take, what the cost will be, and the recovery time so that you can select the option that works best for your lifestyle and future plans. If you have been in an accident dental veneers can fix your damaged teeth. Millions of people are in accidents every year. Whether a slip and fall, car accident, or sports injury, it is common for teeth to get knocked out, cracked or chipped. As a dentist, we can repair and restore your teeth after they are injured. Many patients ask us if their tooth can be saved after it has been knocked out. The answer is, sometimes – yes. If your tooth is knocked out, immediately put it into a glass of milk and call our dentist office to make an emergency appointment. Visiting the emergency room won’t help as they are not trained on how to correct teeth. We will do everything we can to salvage your tooth and if it is not possible we can offer alternative solutions like dental implants, bridges, or dentures. If your tooth was injured in an accident and has become cracked or chipped, we can use dental veneers to correct it. Veneers are an excellent option for fixing problems with your teeth because the process is fairly fast. They are placed on top of your existing teeth, so you don’t have to worry about massive time delays due to your gums healing. If we determine that a veneer can correct your damaged tooth, we will make a mold of your mouth and have one created in the lab. Beyond fixing teeth, veneers can also improve the appearance of your teeth. They can be used to close gaps and make teeth even. Even crooked teeth can be helped with the use of veneers. Patients with dark stains can have them covered up, and smiles are made youthful again. In other words, if you are having one tooth fixed you may want to get all of your front teeth done at the same time. You can have the smile you always wanted in the process. Before dental veneers are placed onto your teeth, they must be created and shaped within the lab. As a cosmetic dentist, we may make minor changes to the veneer but most of the shaping will be done by a dental technician. Your existing teeth will be filed down so that when the veneer is placed on top of it, the tooth will be flat with the surrounding ones. This is an important step for ensuring that your new tooth looks natural. A cement glue is used to bond the tooth and veneer together. Once it hardens you will be able to eat and drink like normal, with your dentist’s permission, and care for it like you would all of your other teeth. Once you have been in an accident and had your teeth damaged, it is important to strengthen them so that they are less likely to become damaged again. You can do this by having your teeth cleaned at least twice a year, brushing after meals with a fluoride toothpaste, using floss daily, and rinsing with an antiseptic mouthwash. This combined with a healthy diet will strengthen your teeth and prevent injury.